Fig. (6) Mechanism of anti-viral effects of PGN632. (a) Lack of neutralization of virus. P388D1 cells were infected with Pichinde virus at an moi of 4 in the presence of antibody and β2GP1 (100µg/ml each). Cells and supernatants were collected on day 3, and virus quantified by plaque assay. Columns, average PFU/ml; bars, S.D. In all the above studies, bavituximab was used as a positive control and erbituximab as a negative control. PGN632 and bavituximab only reduce virus burden by 3-fold (not significant). (b) Significant lack of Pichinde virus antigen-specific proliferative responses. Splenocytes were collected from antibody-treated animals (n=3) 14 days after infection, and were stimulated in the presence of either virus or mock antigen, and their ability to incorporate 3[H]-thymidine was determined. Antibody therapy did not significantly increase the stimulation index. Columns, average stimulation index (n=3); bars, S.D. (c) Opsonization of Pichinde virus. Whole blood samples were collected from animals (n=3) that had been treated with antibody one day after infection, and virus quantified by plaque assay. Columns, average PFU/ml; bars, S.D. (d) ADCC of virus-infected cells. Primary guinea pig fibroblasts in tissue culture were infected with Pichinde virus and, 48 hrs later, were co-cultured with primary guinea pig peritoneal macrophages in the presence of PGN632. Lysis was determined by quantifying lactate dehydrogenase (LDH) release. 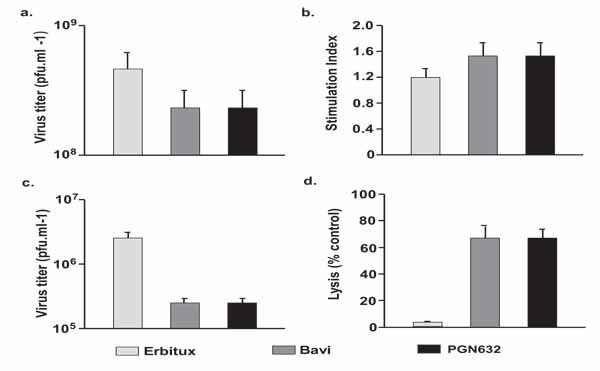 PGN632 induced specific lysis of virus-infected cells. Columns, average percentages (n=3); bars, S.D.